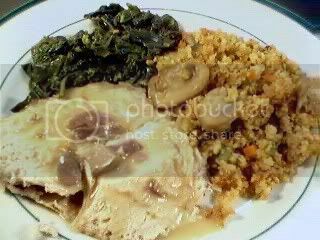 Turkey has been in the food blogging air this week as TingAling did her own trial run, and Drstel reminisced about Thanksgiving dinner past. 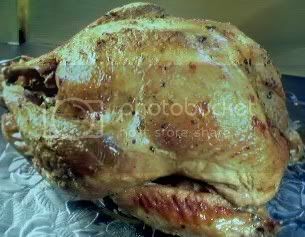 It just so happened that the same day that TingAling posted her turkey dinner, I came home from the store with a turkey. It was on sale. My husband, who just loves turkey and can eat it at least once a month, has been asking for turkey and I have been trying to put his craving off until Thanksgiving. But since the turkey was on sale, I decided to indulge his craving. It is also the baby Clone’s birthday tomorrow, so this was a sort of pre-birthday dinner. Wash turkey thoroughly and pat dry. In a small bowl, mix the salt, pepper and spices. Rub the turkey inside and out with the seasonings, and stuff the cavity with the garlic, onions, celery and carrots. Instead of the vegetables, some people would at this point stuff the turkey with stuffing, but I have gotten a bit paranoid about getting the stuffing up to a safe temperature, so I just cook the stuffing separately, out of the turkey. Bake the turkey at 325 degrees F for about 3 hours, basting occationally with the drippings. Let the turkey rest for at least 10 minutes before carving. I wish we had Thanksgiving here. Haha! Hi everyone! Sorry I haven’t been able to blog all week, I’m just getting around to viewing comments today, and it’s already Friday! TingAling, yeah, we’ve assimilated big time, but you know, I’ve always believed in the saying, “bloom where you are planted”. I think it’s one of the Pinoy’s greatest ability: to assimilate. Obachan, thanks! I’m glad you like the avocado with lemon. I still can’t get my kids to try it. They say its too weird. Manang, no worries, we’ll take care of you! Not that you need much help, you’re a great cook! I love looking at these ideas for Thanksgiving Dinner. I am glad that it was not in my home where we are supposed to celebrate it, though. Christmas ang toka sa akin. I feel confident you and other foodbloggers will give me ideas for the Christmas (ang aga ba?). Para wag mapahiya ang sister nyo sa in-laws, di ba? haha! What a gorgeous trial run, JMom! I wonder what it’s gonna be like on your Thanksgiving day next month. More gorgeous turkey dish? I can’t imagine! BTW, I just tried “avocado with lemon squeeze and sugar” that you mentioned in your comment to my blog. It was simple and yummy! Thanks! Happy birthday Clone. JMom, aren’t we over assimilating :-)? Me too I feel like we’re gambling when we cook the stuffing inside but it tastes so heavenly with the meat juices infused in the bread. Risky business but…! The sides all look luscious too. Husb. and I like collard greens a lot ( subs. for gabi leaves in laing ). So, are you going to have another turkey next month?